An Opportunity to show God's Love! And we need you to pray! Nice to see a smile on Jerry’s face! An Opportunity to show God’s Love! During those first ten days of cleaning and ordering in Baimuru, we got a message from Jerry that he had taken Avoro from Ihu Station to the Kerema Clinic. He said she was very weak, and was having great difficulty getting air, being able to take only a few steps at a time. Within a short time we got a message that the Kerema Clinic was sending the two of them by car into Port Moresby General Hospital. We already had plans to leave Baimuru by dinghy and go to Ihu Station, the purpose of that trip being to spend a short time with each of the Orokolo pastors, and to see our household items being stored in Ihu brought back to Baimuru. 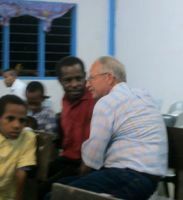 We left Baimuru on a Monday, and spent that night in Harevavo with Pastor Murphy’s family. The next morning, we went on to Ihu Station, where we loaded our cargo. We originally planned to spend that night with Pastor David and Mavina, but felt an urgency to head as soon as we could to Port Moresby to be with Jerry and his family. So, instead, we spent some time that morning with Pastor David and his wife, and then accompanied the cargo back to Harevavo. That night, Pastor Maisa and his wife Jennifer hiked down to Harevavo, and the 6 of us had a wonderful time of fellowship discussing plans for the Bible training of these dear men and their wives. Wednesday morning we set out on a trip to see Jerry and Avoro. The very idea of us traveling all the way to Port Moresby by boat and PVM made a big impression on the Orokolo pastors. They saw it as an expression of love and support, exactly what we intended it to be! After a two hour, fairly rough dinghy ride from Harevavo to Kerema, Preacher Jack helped us find a “safe”, sober PMV driver! Jack was traveling to Malalaua, a coastal village between Kerema and Port Moresby. The vehicle is much like something the military might use to transport troops - a cab and a long bed with benches along the sides. We were very blessed that the driver allowed us to sit up front for the ride; I am sure the 10 hour trip would have seemed much longer in the back! We only had one serious delay while some adjustments were made to the brakes. (I would swear the tool box only had a wrench, screwdriver, and rubber band in it.) We did get stopped briefly three other times once it got dark: by security guards at a rubber plantation, and twice by the police, one with an AK-47, looking for three dangerous, recently escaped convicts. We got into Port Moresby about 9:30 pm Wednesday night. The PMV took us to the house Jerry and Avoro were staying; the home of her brother, Pastor Mapo Hailai. That next morning we got a call from Jerry saying that they were returning with Avoro to the hospital. We arranged a taxi with them and got her back to emergency. She could barely breathe. This is a third world country and medical care is different here. Avoro was told she would first need an x-ray. So we waited with her several hours of the morning until this was completed and the x-ray was in her hand to take back with her to a bed in Emergency. It was not until the evening, that a doctor looked at that x-ray, put her on oxygen, and started making plans to drain more fluid from her lungs. This stay went from that Thursday morning until she was released Monday morning. The hospital provides medical care and a bed. Your family and friends must provide food, bedding, and even things involved in your care like “washing”. We spent long hours a day at the hospital. People notice things like a white missionary hanging around your bedside! They would ask Avoro who we were, and who she was, that she would have friends like “us”. I know some of this sounds very odd. We were an oddity in the hospital ward. This not only showed our love and commitment to Jerry and Avoro, but also to their families, and gave many opportunities to testify to the goodness of God and share the gospel. What a wonderful place it was to hand out tracts! During this stay, the scan that was planned for the 31st of May was performed. It showed that the cancer had moved to Avoro’s lungs, liver, and lymph glands. It is at Stage 4 and the doctors have done all that they can beyond providing some drugs to make Avoro more comfortable. Doctors do not offer much information or counseling to their patients or families. This was a role Trina and I took on. We made sure that questions that Jerry and Avoro had were asked and answered - and that they were clear about the information they were getting. We did everything we could to keep their focus on their strong God and blessed Saviour. We tried to ask questions that would help them think and prepare for Avoro’s care outside of the hospital and for dealing with issues that might come up among family members. We listened to Christian music with them and read Scripture. We prayed. And we need you to pray. There is no hospice here; there is not even oxygen available for Avoro outside of the hospital. We do not know if God will intervene in Avoro’s situation. If He does not, we do not know how Avoro’s death will impact Jerry or his ministry plans. Avoro’s extended family will need your prayers too. 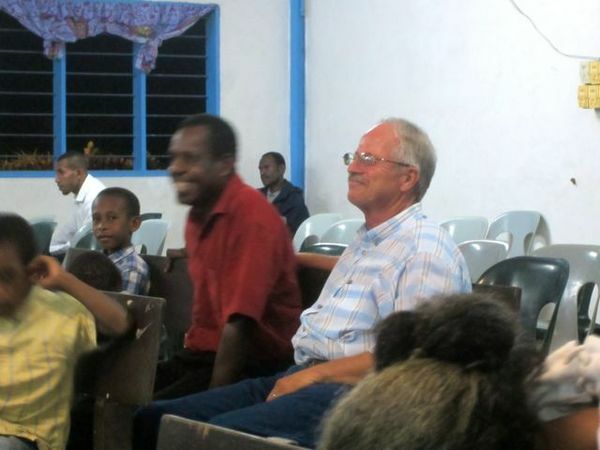 Missionary work has a lot of “faces” - but it always involves loving people. Thank you for letting us be here, loving these folks, in your stead.